The leather loafers is designed for toddler walking and fits for children wear it with casual and formal wear. 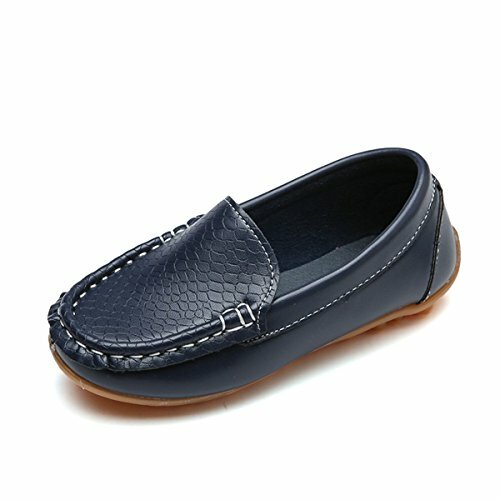 This loafers with the rubber sole is good for children wear it comfortably and lightweight, providing them the great traction in the walking trip. 100% Customer satisfaction Guarantee, feel free to leave Customer Questions & answers or email. Comfortable Lightweight and Soft- The Rubber Sole is flexible and soft that Children can wear it comfortably in safety Condition. Good Quality and Durable - Thick sole and well made, the stitch and rubber sole is not easy to crack. Easy Slip On and Great for Traction - Convenient Slip-on design and nonslip Rubber Sole with skulls is durable for walking. Fashion Cute Design - Simply casual stylish and unique in leaving your children elegant impression. Suitable Condition - Suits for child great wedding shoes, dress shoes, uniform Shoes and baptism shoes and casual formal wear. If you have any questions about this product by Goeao, contact us by completing and submitting the form below. If you are looking for a specif part number, please include it with your message.